Translator and proofreader’s note: There are large parts of this document that don’t parse well either from Chinese or from Naomi’s written English into more fluent English. In trying to do so, some of the emotion that Naomi is trying to convey would be lost. I’ve left those passages as originally written in her own English because there was simply no way to clean them up without losing her intent. Me in better times, excited by some new fiber optic cables. 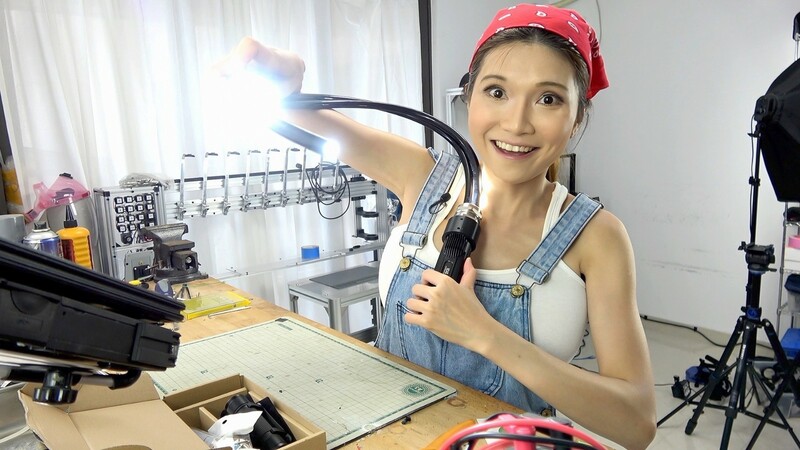 I’m Naomi Wu a DIY and tech enthusiast in Shenzhen, China. Nine months ago Vice Magazine contacted me for an interview. A lot has been written about that, very little by me. I’ve avoided writing about my experience with Sarah Jeong, Jason Koebler, and Vice Magazine in detail because I can’t explain the whole story the way I want to. I can’t really blame anyone who is unfamiliar with China’s issues, who might say “Naomi, I don’t see what’s the big deal” or think I’m nuts, or who may’ve otherwise been unable to connect the few dots that I’ve provided. I’m sorry for being vague about my full side of it, but one day I’ll be able to write every detail and things will be clearer. In the meantime, this is what I can write, and again, I’m very sorry it’s so incomplete. Like Vice has done in many other places, they sent a reporter to China to interview me. It’s important to understand- I’m a PRC citizen. Born, educated and raised here, unlike many wealthy Chinese you may have met, I have a single passport. I also have as far as I know the largest English language following on YouTube and Twitter of any PRC citizen living in China. Both of these platforms are blocked in China and I maintain my accounts by using an illegal VPN. I had, prior to my contact with Vice a habit of posting regularly (and often heatedly) about gender issues in China. If you know anything about China, you know all this makes for an extraordinarily delicate position that has to be handled with great care. I am not a blind nationalist, but I actually do love living in Shenzhen and I have no plans to emigrate. I know it may be hard to understand, but I feel life here is improving every year, and I like using my YouTube channel to document my life, local tech, and personal hobbies. But just like anywhere else, you play by the local rules if you want to stay- both written and unwritten. China rules are very different than Western rules- and not all of them are worse as you might think, although some of these rules may seem strange to Westerners. To their credit, foreign correspondents here in China are incredibly professional about understanding that locals need to work within these rules. Before Vice, I’ve never heard of journalist here endangering a source. It’s one of the reasons Chinese have historically held foreign media in high regard (although this has slipped a bit in recent years). In negotiating Vice’s visit, I was, of course, hesitant- as anyone in my position would be. In the past I’ve worked with outlets like the Wall Street Journal and been delighted with their care and professionalism. Publicity in China carries great risk, but it also helps get me followers so I can afford to continue shooting for my channel. I exchanged several emails with Vice magazine making it clear what the scope of the article would be. The key points being no discussion of sexual orientation or my relationships. This is a very small request as Vice Magazine has interviewed countless male DIY YouTube creators without ever asking them to respond to 4Chan/Reddit allegations about who they sleep with (as they did with me). 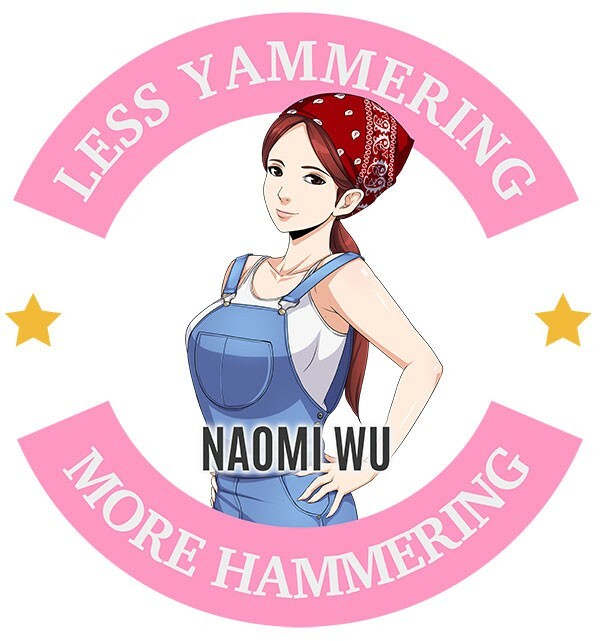 The agreement between Vice Magazine, and Naomi Wu. When the Vice reporter came in January 2018, I showed them around Shenzhen for three days. During this visit, I brought the reporter to my home, long enough for the reporter to get an in-depth idea of my circumstances. In my home, I worked on an automated bartender project I had built for a friends bar- to address with the best possible evidence the ongoing Internet smear campaign against me that only a White man could do work like mine. All this was apparently not juicy enough for Vice. Frankly, it’s very rare I get accused of not being click-baity enough just being myself. 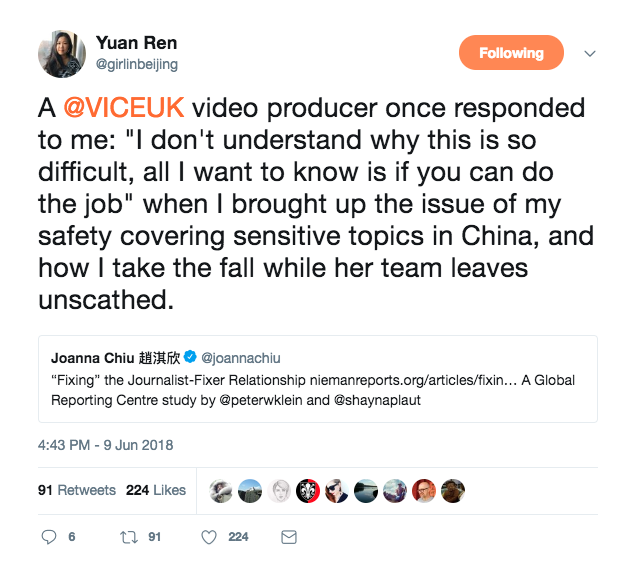 Even the most basic level of professionalism was too much to ask of Vice- and yet they want to hide behind the title of “journalists” and claim to be above any accountability, when they are nothing of the kind. These are not games you play in China, it doesn’t matter if the sum total of their experience living a warm sheltered life in America makes them think it will probably be ok. Things are not the same here. That is not how agreements with sources works, Vice wasn’t in a position to understand the exact nature of the risk I face or what limits have to operate within- and didn’t care to find out. It doesn’t matter if the story “reads positive” or “seems fine” to an American reader- they are not who I have to be concerned with. Vice would endanger me for a few clicks because in Brooklyn certain things are no big deal. This is not journalism and does not deserve to hide behind the protection legitimate use of that title warrants, this is a savage abuse of privilege knowing full well that in China I had no possible recourse against a billion dollar company who thought titillating their readers with my personal details was worth putting me in jeopardy. I begged them through a series or emails not to do this- to consult with anyone who had ever been a journalist in China and verify what I was telling them. I was then put in touch with the editor-in-chief Jason Koebler. He dismissed it- arrogantly sure he understood the threat model of a Chinese women with a massive social media following who had been outspoken on local gender issues, while at the same time making it absolutely clear he did not understand at all or frankly even care enough to Google what is a routine occurrence in China in these circumstances. It’s not that a White American can’t understand China- that is nonsense, there are countless American journalists and scholars here that are experts in this field that Jason Koebler or Vice could have contacted to verify what I was telling them, I begged them to. They simply didn’t care. What could I do? When it was clear they would publish no matter what I said, I took to Twitter. But of course, Vice and Jason were clever and knew my hands were tied. I can’t very well spell out my risk without putting myself at risk. I can point out it’s sexist to discuss my relationships but never discuss the male DIY YouTube creators they feature relationships? A weak argument. I can point it out loudly, but it didn’t really explain why I was so scared, so desperate- I just looked a bit nuts. Which happens a lot when you have to worry about things that your audience on the other side of the planet has never had to worry about so think just aren’t real problems. So Vice just continued to ignore me. No one will tell you I am a typical Chinese girl. I have a difficult background. I have had to fight for everything my whole life. When I became a tech enthusiast, due to my strange appearance I had to fight to be allowed to speak at events, and then fight for other Chinese women to be allowed to speak as well. In the West powerful men declared there was no way a Chinese girl could do what I do. I beat them and proved them wrong also. Still, if needed I will show up with my soldering iron and my kit anywhere if anyone doubts me. I am no coward to be easily bullied. My mother taught me that one day a man will beat you, and you should keep getting up until his hand is broken to teach him the lesson that it will never be easy. I live by that. For the past few years, I’ve fought for my right to participate in my field as an equal- because I’m qualified not through some charity or quota. I fight in the tradition of the hacker community- with tech. I have engineered and deployed WiFi hacking drones to send messages and built and worn LCD clothing to attract a crowd to listen to me speak about letting Chinese women participate in tech events as more than just decoration. Why else do we encourage young women to learn STEM if not to empower them with new tech for a new age? If I am not scared to do this in China, I am not going to be scared of some Brooklyn hipsters who think they can come to China, leave and throw a Chinese woman under the bus. Things are not perfect in my country, we struggle very hard to fix our problems and catch up in many ways, but we have a sense of right- and this was not right. Right now, I have no power. Almost every American journalist I contacted for help ignored me. I was told “hire a lawyer” as if I have the means for that. Even when I spoke to American lawyers they said technically the written agreement was not a legal contract so it would be easy for Vice to wriggle out of it- since they have an army of high priced attorneys. I’m just a Chinese girl fighting a huge media empire that does things like this to people every day without consequence. Things like right and wrong don’t matter; they can do anything they like to me. I couldn’t even get a visa to America to fight them. I’d stand in front of their office and shout all day if I could. The message everyone gives me is to simply give up, they are American, they are too big, too rich, too powerful. But I won’t give up because what they did to me was wrong. I’m Guangdong born and bred, daughter of the Ten Tigers, my ancestral home is Foshan- the same soil as Wong Fei-hung and Ip Man- you can’t come to our place and bully a local girl. Even if I die you can’t do that. So I fight how I can. Sarah Jeong wrote an article on the use of “unmasking” to address abuse on the Internet when you are absolutely without recourse, in this case this was not the hurtful language and threats I get a thousand times a day, this was the potential for very real and personal harm. My attacker would not stop, would not listen to reason, did not care what harm might come to me. I don’t care if someone gives himself a pretty title he does not deserve and tries to hide behind it. If you earn a living hurting people weaker than you, you are no journalist and do not get to claim the protections of that honorable profession. My emails to Vice and American journalists were ignored, Vice was refusing to honor the agreement, refusing to even consult an expert on my risk. So I found some public records on the Internet. I found an address for Jason Koebler, the Vice guy who thinks it’s ok to abuse a Chinese girl just because he has some power. I’ve heard Vice guys like some power over girls so maybe that’s it. But not this girl. So I waited until the day that celebrates the famous American Hacker Aaron Swartz. He is a hero of course. I got my tools, my CAD, my 3D printer and I fought the only way a small Chinese girl can- I build tech. I created a pair of boots with tiny video displays in the sides, the video they play is of me making the boots. And, for a few seconds they flash the address I found for Jason Koebler. In the final video less than 5 seconds. Just showing a little bit. So they will please stop. So they will please listen to me. So they will please ask someone what will happen to me if they are careless. I emailed the video to Jason (but did not post it) asking him to reply to emails, let me explain the risk. Nothing. He and other Vice employees are always so arrogant, so typical to think he is better than anyone else and can do anything he wants just because someone does not have that magic blue passport that makes him feel so special everywhere in the world Vice goes to damage local lives for a stupid story. But…I got a little worried. All the Internet info says he lives alone. I’m not posting anything new that anyone who wished him ill does not already know- but would not want to concern a parent. What if he has a relative living in his home? Like all Chinese I love children very much, since we have had so few under the one-child system. I am already twenty-four and I have no baby. So of course I asked- politely to make sure, since this is serious. Then I posted the video. Of course, no one but Jason even notices the address in the video because it is so fast and so tiny. Vice has expensive lawyers and they convince YouTube to take the video down which was reasonable, and Patreon to terminate my account. In the past Patreon wouldn’t terminate accounts of some horrible people who violated their TOS also, but no one wants to mess with Vice lawyers. It was petty and vindictive, meant to shut me down and teach me a lesson. Did the first, never the second. Vice- with their usual sense of journalistic ethics, selectively released parts of our private emails to bolster their narrative as “Vice Magazine- The Innocent Victim In All This”. Also as a sort of backhanded threat to me that they could release other private emails containing more sensitive personal details if I kept pushing. I have a feeling that or something like it, is what will happen in response to this article- which is why I’ve been reluctant to go into more detail until now. 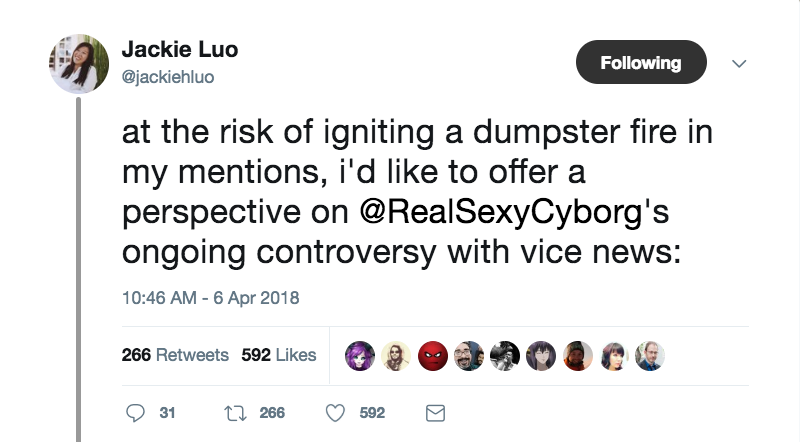 Despite Vice’s firmly established track record of deception and truly disgusting behavior, particularly towards women in vulnerable positions- people actually bought it. That breaking an agreement with me, that putting me in danger- this was nothing because some sleazy grown man in Brooklyn who was willing to endanger a young woman for a few extra clicks had a publicly available address shown for five seconds on a shoe- he was the real victim. Or at least the kind of victim Americans actually care about. At this point, I don’t care who disagrees. I’d do it again even if it costs me my life. Wrong is wrong. Powerful media corporations should not abuse their privilege and platforms to bully and endanger the same people they profit off. We are people too and we can’t always fight back pretty and clean with expensive lawyers the way you can- it does not mean we deserve to be abused because we can’t fight the way you think is ok.
I’d lost all my monthly income because I had no Patreon. Most alternatives PayPal, Drip etc. don’t work in China (yes really, no cryptocurrency and peer-to-peer tech aren’t viable options, yes I know you don’t believe me, trust me if it were easy there would be more Chinese YouTubers, ok got it- you don’t believe me. It’s still true). I went back to what I used to do for a living- Web Development, freelance coding online for overseas clients. I code under a male pseudonym so my unusual appearance does not cause difficulties. I couldn’t run my YouTube channel anymore since it’s very time consuming and without Patreon the revenue from that is quite small compared to coding, and full time coding was required to support myself with little time left over. I like to cook at home anyway and Chinese food is cheap to make. I was ok, it was all worth it and I’d do it again. True poverty is not being able to afford some small principles. I could afford to stand up to bullies, and one day there will be a way to have grandchildren and they will know I did. Then I had some other bad problems I can’t discuss, but they were what I was worried about from the beginning. I had to find a way to solve those and find new income before I could get back online. 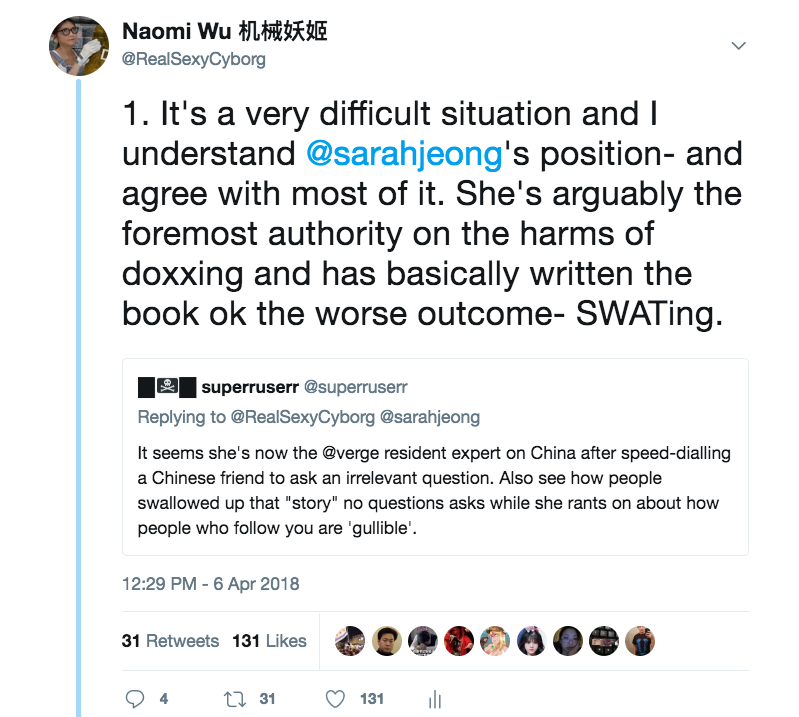 Then Sarah Jeong decided to attack me on behalf of her former co-worker Jason Koebler. I’d followed her but had never spoken to her before then. Sarah did not come to listen, mediate, or learn- she was sent by Jason Koebler to destroy me and protect a business model that has endangered voiceless sources in the developing World countless times. Sarah Jeong was educated at Berkeley and Harvard and only an idiot would deny the woman is quite brilliant in her areas of expertise. This has given her a large platform and she is considered the final word in her respective fields by many people. Some of the areas that people look to her are law, Internet harassment, and Asian-American issues. As a journalist- this is her beat, and her word on the subject carries a crushing and near irrefutable weight. The deliberate folksy use of language by a Harvard trained lawyer disguises an extremely succinct and frankly elegant hit piece designed to destroy my credibility. Sarah, although fully aware of at least one of the more immediate threats to my wellbeing, cleverly choses to cast it as a simple issue of an interracial relationship. A mild concern- surely overblown? Having built her strawman of “interracial relationship” being my complaint, she set two matches to it. The imaginary anonymous source who corroborates interracial relationships are no big deal (again, at this point the audience actually believes that’s the issue). 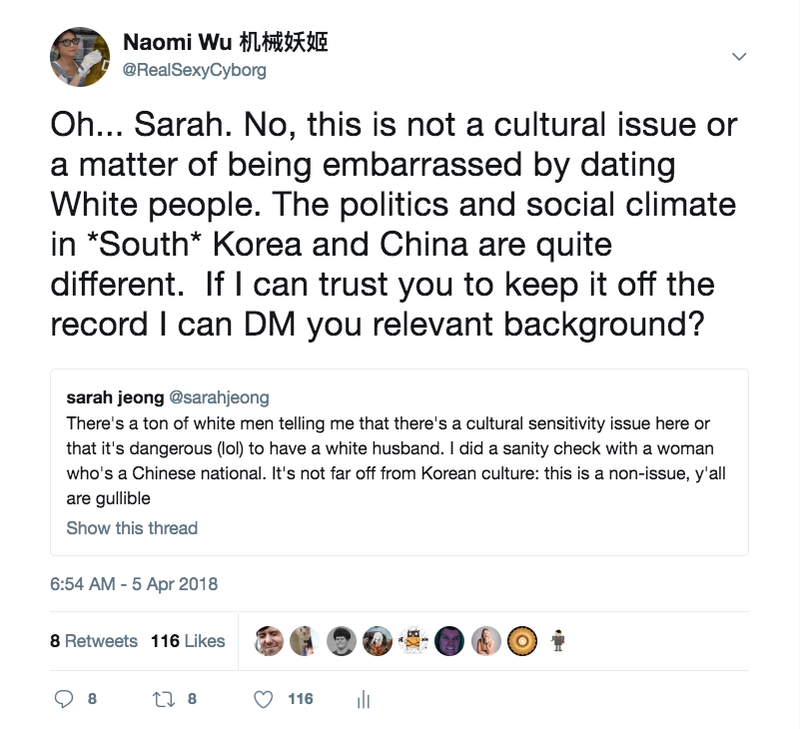 Interestingly enough Sarah has been attacked online for only dating White men, so knows it can be a risk for some Asian women- but also knows from speaking to Vice it’s not my concern. She has zero problem being intellectually dishonest when it suits her goals. Then Sarah drops a veritable atom bomb of an Appeal to Authority, she is Korean (having lived a full week as an adult in Korea). South Korea is pretty much the same as Mainland China, therefore I was never in any danger. She invokes the monolithic Asian culture myth precisely because she knows her largely White audience believes this anyway. Sarah knew the truth, she also knew I was straight-jacketed and could not fight back. I was stuck miserably saying “it’s not that”. Honestly, it was a thing of beauty- pure willful evil of course, but you have to respect the costly training and centuries of legacy knowledge bestowed by highest institutions of learning in the World applied like a magnifying glass on an ant. Yes, in retrospect I was a bit of a naive idiot for thinking Sarah didn’t know exactly what she was doing. No response from Sarah. Then or any other time I reach out to her via Twitter DM to discuss the issue privately. The support I had previously had in getting Vice to limit the story to what had been agreed on, to treat me the same as the countless DIY men they cover without mention of their personal lives, and to having my Patreon account restored- evaporated. Sarah had won- and she knew it. She’d been trained by the best universities in the World to fight exactly this kind of fight, to win by any means, for right or wrong. She was a trained Special Forces combatant against child. With the platform that journalism gave her amplifying that power, sent on behalf of the exact sort of “privileged White man” she claims to despise, she went out to destroy another Asian woman. All while knowing full well the issue was far more complex than she was pretending, the facts completely different- and simply not caring. Not then, not in the following months when it became clear to more and more people just how badly she had abused her power, her education, her profession, and her privilege. It took me two months before I could start up again, and then only with sponsorship provided by a Chinese tech company and with more strict limits on what I could post. No more nuanced discussion of tech issues on social media- Tor in China, VPNs as a wealth and class filter, gender equality in Chinese tech, MakeEd training for young women- all off-limits now. My income is half of what it was with Patreon and I am not well-off to begin with. The effect this has had on my life, my content, my standard of living- has been devastating and Sarah played no small part in it that. I have been vocal in calling for Sarah to be accountable for her actions for the last four months, this is not some new opportunistic thing for me. It’s everyone else who are the Johnny-come-lately-s, and just because they are American it does not mean their concerns are more important than the actual harm done to me. Remember that email agreement with Vice? The one they have not disputed? If you were a source in a vulnerable position, would you talk to her? But the sources won’t know how Sarah feels about agreements- just that she works at The New York Times. A position at the New York Times will amplify Sarah’s power one hundred fold, and if I thought she would never again abuse her power in this manner I’d stay out of it. But since she is unwilling to address her mistake, to come to terms with what she did I can only assume she intends to do the same to others. This is why I am vocal in my objection to Sarah Jeong having any position at the New York Times. The position, properly filled requires someone with both competence and a conscience, Sarah has the first in excess and but not a shred of the second. I don’t think anyone should support someone who does not seem to be an actual believer in the values they espouse, but is instead a follower of convenience and absolutely comfortable it betraying those values when it serves her own ends. In the meantime- if I’m going to keep my YouTube channel alive another month I’ve got a workbench full of projects to finish and videos to shoot. Like what you read? Give Naomi 'SexyCyborg' Wu a round of applause.